You’d think as it is summer, that I would be well rested and my creative spirit would soar. Sadly, I am feeling just the opposite and all I want to do is lie on my bed and watch hulu.com. It’s not like me, but I am tired. Really tired. It’s a high class problem – too much to do, too many wonderful people to see, too little time. So, I have dug deep and pulled out some creative jump-starts. One is cooking, one is finding the perfect gifts for thanking all the people I will have to thank this summer for all the nice things they are about to do for me and one is learning with a fabulous teacher and fun, heartfelt and creative spirit who simply helps me see the world in a whole new way. First, the food. Everyone has some where to go and has to bring something to the party. I was on for dessert Saturday night at dinner club and I brought home-made s’mores. Crazy – but fun and actually tasty! I made the graham crackers http://www.101cookbooks.com/archives/000126.html, I made the marshmallows http://www.sugarlaws.com/homemade-marshmallows and I bought good old Hershey’s chocolate. Two tips: make sure you roll the cracker batter thinly (mine were more like Graham bricks) and let the marshmallows set for as along as you can. They gel better. But these were fine and fun! A new twist on an old summer staple! Hand painted wooden bowls and fiber art pieces (bags, wall hangings, etc) all hold Barbara’s unique style and eye. They are truly works of art and will surely delight the recipient. We gave a Solway bowl to my Dad and Pam for their anniversary. They are lovers of wood and glass. I have a small purse to wear across my chest when I travel and another small bag I keep my personals in. 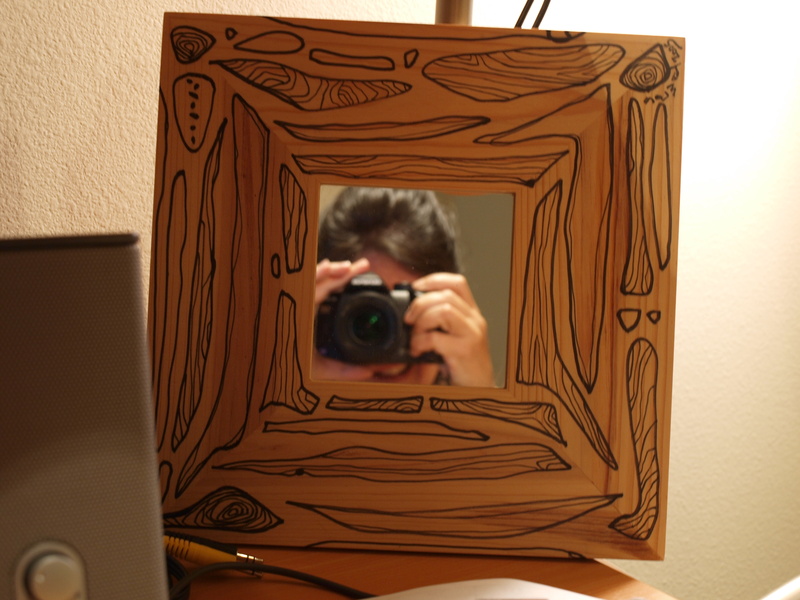 Addie has a fiber heart hanging from her bedroom doorknob and the mirror in the picture below, rests in my study. My back faces the doorway and I use the mirror to fix the feng shui. Its complex simplicity stimulates me on a subconscious level every time I look at it. And then there is Judith Cassel-Mamet at http://www.jcmamet.net. Pick up a glue stick and be prepared to let the hours fly by. Judith teaches all sorts of mixed media art techniques. If you click on my past entry on travel journals, you will find an example of one technique. I will do a whole entry on a fun idea that Judith will help me share with you, but in the meantime, check out her site and blog. There are so many fun ideas and links to other creative spirits. I guarantee you will find SOMETHING that gives you an idea and makes your day a little more saucy. Just writing this entry has gotten my juice flowing again. Imagine if I logged off the computer and picked up my glue stick, just how energized I could be. Hmmm… think I’ll find out! How do you MINDfully get over being tired and get your energy flowing? Let us know!